Rabbi Tomer & Alexandra Kanarit: This, Abq Jew assures you, you've got to see! Abq Jew stumbled upon this street-musician version of Led Zeppelin's Stairway to Heaven while looking for something else on the Internet - you know how it is. But the street is in the Holy City of Jerusalem - in Zion Square (Kikar Zion), to be exact, located at the intersection of Jaffa Road, Ben Yehuda Street, Herbert Samuel Street, and Yoel Moshe Salomon Street. 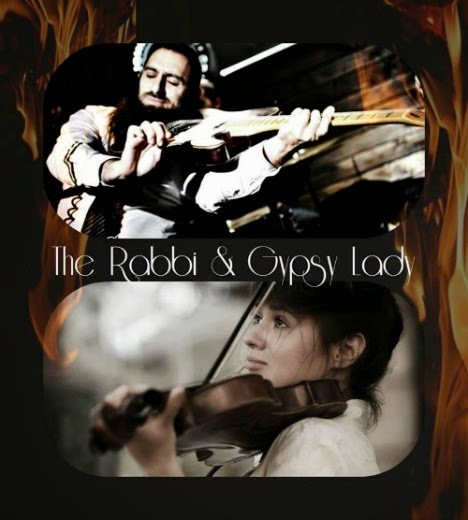 And the musicians - Rabbi Tomer and the Gypsy Lady - well, they're also performing on a wholly different level. - welcoming Jews back home! Well, it took a little bit (not really a lot) of Googling, but Abq Jew managed to track down The Rabbi and the Gypsy Lady. Rabbi Tomer was born and raised in Kiryat Ata. Tomer is a singer, artist, creator and composer. Performs original material and covers. Since Tomer remembers himself singing and playing the guitar. Friends, family and anyone who wanted to stop and listen. His soul and his love of music did not let him stay fixed in place [as a congregational rabbi], and he finds himself in a special round of performances and unique all over the country. This time in Tel Aviv, Jerusalem and two days a week in Nahariya. Tomer is the Wall of Jerusalem's Zion Square and the joy of the people of Israel. From Alexandra Kanarit's Facebook Page, we learn only that she is from Kirovohrad, Ukraine; and that she studied music at Kyiv National University of Culture and Arts. How did Rabbi Tomer and Ms Kanarit meet? Abq Jew hears you ask. 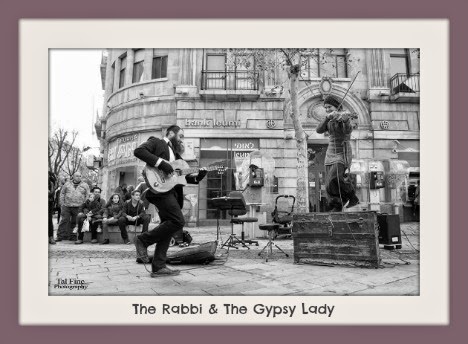 Zion Square is like a home for The Rabbi&Gypsy Lady. Three years two street performers was playing for people in Israel bringing joy and happienes, but they never saw each other. הרב תומר mostly was playing in Jerusalem and Alexansra Kanarit in Tel Aviv. One day she decide come to Jerusalem play in old city. She was walking from bus station and flying in her inner world, in the moment when she passed kikar tzion, central place in Jerusalem, she hear some rabbi singing and felt some spacial energy which bring her to him. She came to put some 2 shekels (it was last money what she had, but she didnt care, it was tradition for her come to other city to play and be with no money, because she trust G-d ). So... she came to him and he saw the violin with her. He asked "Maybe you play one song with me? ", she look at him, think and not anwer (this time she start do tshuva, and thought thst maybe its not very good idea for women play with a man, because before she'll even not think when someone asking join his playing), he see maybe she dont want and ask again: "Just one song, after you go", she say: "Ok, lama lo (why not)". It was song ובלל'לה (at night)- now this song is some from there favorite ones. When they played all people who was there (also them) felt this spacial energy, energy of ONE. She meet her self in man body, her half, and he found his dream (he always dream about playing with some crazy female violin player). Alright ... here's an Israeli Medley (and a bit more about Alexandra Kanarit). You are always welcome to our show. We love you and never want to leave playing on the street.